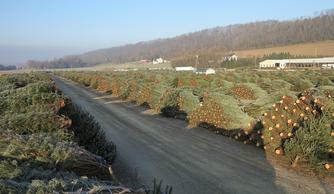 How to Buy Christmas Trees at Buffalo Valley Produce Auction Inc.
Buffalo Valley Produce Auction Inc. ITEMS AVAILABLE: 30,000+ Wreaths in many sizes both decorated & undecorated, 5000+- Rolls of White Pine Roping, Specialty items such as Kissing Balls, Centerpieces, Swags, Grave Blankets, Candy Canes & Crosses, Winter Berries, Bulk Greens, Many Unique Arrangements, & Much More. TREE QUANTITIES: 40,000+- Trees. Average lot size is 50 for standard sizes. Large trees & exotic varieties are typically in smaller lots. SPECIES: Fraser, Douglas, Canaan, Concolor, Balsam, Grand Fir, Nordmann, Turkish, Blue Spruce, White Pine, Scotch Pine, & More. Most of our Frasers are grown in North Carolina while the other species are grown in Pennsylvania. TRUCKING: We have many trucks available to deliver to you. All you need to do is purchase the trees. Contact the operations manager for more info. You may also supply your own truck. LOADING: We have ample staff to load your trees everyday except Sunday ($0.45 per tree) whether you use our trucks or your own. Or you may load your own trees. LODGING: Many people choose to attend both days of the auction so local lodging is listed here. PAYMENT: Cash or Check. Credit cards are accepted with a 3% fee. Customers paying by check may be required to sign a note personally guaranteeing their check. Buffalo Valley reserves the right to refuse checks from any customer it views as a credit risk. All purchases & trucking must be paid prior to leaving BVPA. Pennsylvania sales tax is charged unless a sales tax number is registered with us. Trees must be removed by December 6th.